A Crown Heights mural on mental health awareness on Troy Avenue and Park Place outside of MS354, The School of Integrated Learning. 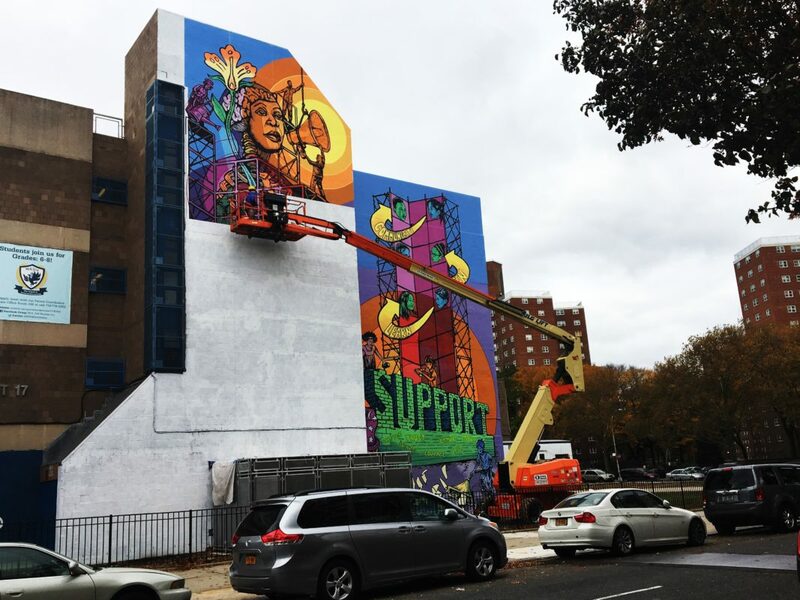 CROWN HEIGHTS – The New York City Mural Arts Project made its mark on Brooklyn this year with a four-story mural on mental health awareness. 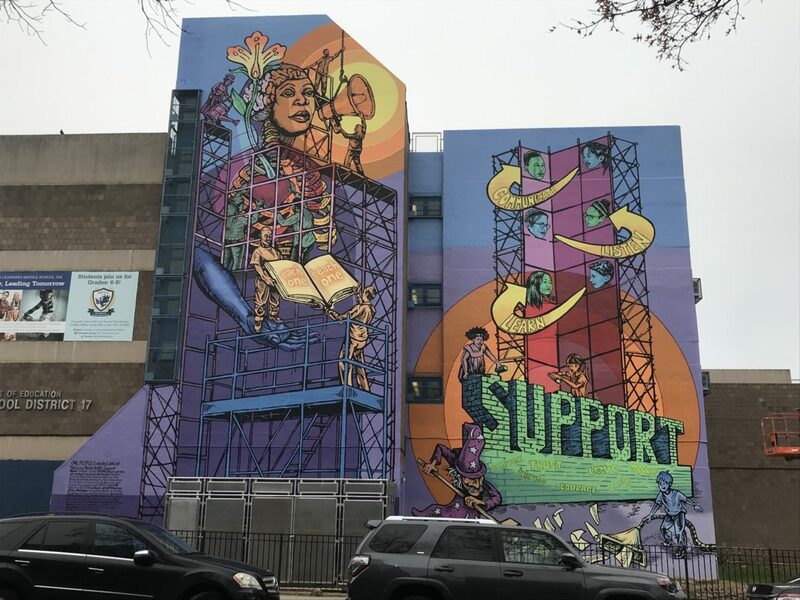 The mural adorns the walls of The School of Integrated Learning, MS 354 at Troy Avenue and Park Place, and is one of six across the city, but the only one in Brooklyn. A colorful image of a woman trapped in what seems like scaffolding displays boldly near NYCHA’s Albany Houses. New York City’s Department of Health and Mental Hygiene sponsors the mural project, and Christopher Cardinale is the artist of this one. Over the last three years, community residents and artists have been collaborating to destigmatize mental health by working together to create murals. 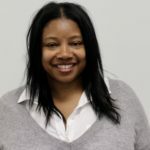 “The art is a way to get the community to talk about mental health,” said Myla Harrison, representing the Health Department. Volunteers took part in most phases of the mural development in what roughly took a year to complete. The initial discovery phase began last December and included recruitment. From December to March, Cardinale and volunteers held design sessions where the community juggled with ideas for the mural. In April, volunteers helped print, label, paint and glue the panels to the side of the school building. Members of Services for the Underserved participated in the design and production phase. The non-profit works to change the lives of those with disabilities, impoverished and the homeless. Members of The Youth Leadership Council with Albany Houses volunteered also. “People in the community would walk by and ask questions about it,” said Stacy La of Prospect Heights. La, 34, said she enlisted because she wanted to learn how to paint murals but gained so much more. This is the mural project’s third year. Each year volunteers, people with mental health issues, and a lead artist complete one of three projects. Murals are scattered throughout the Bronx and Manhattan so far, but more are coming to Brooklyn. The Office of Mental Health funds the project at an annual cost of $500,000, according to Harrison. The artist has painted murals since 1996. Cardinale, 46, also works with inmates on Rikers through another mural project Groundswell. The artist encourages people to visit the mural and “embody” the experience on their own. But he did hint to the meaning of one figure at the top left corner of the mural – bright yellow flower petals with highlighting the flower’s stigma. “Stigma is part of a flower’s anatomy,” he said. “That’s our positive symbol of transforming the negative experience around mental health,” he added. Organizers wouldn’t give away the location of the next mural. But they confirmed they’ll work with two non-profits in East New York and Sunset Park. Stay tuned.